How does a club apply to become a member of the Development Academy? What criteria are used to evaluate membership applications? What fees are associated with being an Academy club? Can Academy clubs schedule 'friendly' matches during the Academy season? How does someone tryout for an Academy club? What age groups compete in the Development Academy? Can Academy players participate with non-Academy teams? Which teams participate in ten month programming and do not allow high school participation? How does participating in the Academy effect players being seen by elite coaches? The Development Academy is a partnership between U.S. Soccer and the top youth clubs around the country to provide the best youth players in the U.S. with an every day environment designed to produce the next generation of National Team players. The Academy's programming philosophy is based on increased training, less total games and more competitive games. The Academy also connects National Team coaches directly with the Academy clubs to develop and identify players and coaches for future Youth National Teams. Each Academy team is evaluated by a member of the Men's Scouting Network at least 10 times each year and each Academy club receives two formal evaluations in over 100 categories each year from U.S. Soccer Technical Staff. 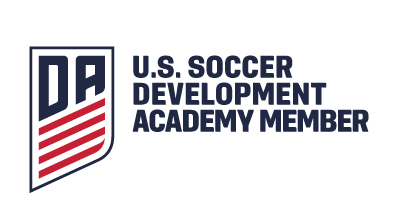 Clubs interested in being considered for the U.S. Soccer's National Team Development Academy Program must submit their Membership Application to U.S. Soccer no later than Dec. 31, 2013, to be considered for admission into the 2014-15 Academy season. Clubs can download the application here. The Scholarship Program is a joint venture between the U.S. Soccer Federation and the U.S. Soccer Foundation to help Academy clubs and players move away from the pay-to-play model of soccer. For more information on deadlines, the application process, eligibility and program requirement click here. There are currently 88 clubs that participate at the U-13/14 age group and 79 clubs that participate in the program at the U-15/16 and U-17/18 age levels for 2013-14. Academy clubs are located throughout the country from markets with a history of National Team player production, and for the younger age group are based in key markets that minimize the amount of travel and costs for league play. There are no team or club fees associated with becoming a U.S. Soccer Development Academy. However, players and coaches must be registered with U.S. Soccer. Registration fees for U-15/16 and U-17/18 players are $10 per player and $25 per coach; U-13/14 players are $100 per player and $50 per coach. Fees are subject to change. Academy teams are only permitted to participate in Academy competitions (league games, showcases, Academy Playoffs and Finals Week) and non-Academy events approved by the Academy Technical Committee. Academy teams are not permitted to participate in competitions such as State Cup, Super Y-League and US Club Soccer and high school teams. The U-13/14 age group incorporates eight (8) divisions in the three (3) conferences, with the East Conference featuring the Sunshine Division. Each Academy club plays approximately 30 league games, including 6 games played at Showcases. The season begins in September and commences with Finals Week in July. Clubs will break from league play for periods of inactivity due to weather or the end of the season. Clubs are responsible for all team travel expenses. U.S. Soccer will cover all travel expenses to Finals Week for Academy teams that qualify for the event. U.S. Soccer assigns referees for Academy games and covers the costs associated. Anyone interested in trying out for an Academy club will need to contact the club directly for specific information regarding the tryout process. For club information, use the 'Club Directory' here. The program currently utilizes three (3) mixed age groups for competition: U-13/14, U-15/16 and U-17/18 age groups. Clubs competing in the U-15/16 and U-17/18 age groups must field teams at both age levels. Academy teams are encouraged to place players at their appropriate ability level. For example, the U-17/18 team should include a balanced mixture of 17-year-olds, 16-year-olds and a few exceptional 15-year-olds. Academy clubs are required to maintain a minimum of 36 full-time players on their club player pool. There is no limit on the number of players that can be rostered as long as each player starts a minimum of 25 percent of the club's matches. Can Academy players participate with non-Academy teams during the season? Full-time Academy players are only permitted to participate on their Academy team, and National Team duty. Which teams participate in 10-month programming and do not allow high school participation? The entire Academy program does not participate in high school programming. For a complete list of clubs and more information on the 10-month season, click here. Academy competitions provide ideal opportunities for coaches to scout players in their natural environment. Over half of all Academy matches are observed by a member of the National Team scouting network. In a move designed to improve the development environment for players throughout the country, the U.S. Soccer Federation has taken the initiative in formalizing a nationwide development academy that began in the Fall of 2007. The U.S. Soccer Development Academy has admitted 63 elite youth soccer clubs from around the country to join the program. How does a club become a Development Academy? What criteria will U.S. Soccer Coaches use to evaluate club applications? Is there a club registration fee to become an Academy Club? Does an Academy Club have to field a team in the U-18 and U-16 division to participate in the Academy? How many players can be included on an Academy Team Roster? Can Academy Teams include younger players on their roster? What is the format for Academy Competition? What are the Academy Playoffs and how does my team qualify? Will the playing calendar be the same for all conferences? How much will an Academy Team be required to travel? Who will select fields for Academy Competitions? Can Academy Matches be played in concert with a Club's non-Academy Tournament? Can Academy Teams schedule 'friendly' matches during the Academy Season? Can Academy Players participate on non-Academy Teams during the Academy Season? Who will assign referees to Academy Matches? Who will pay referee costs for Academy Matches? How will participating in the Academy affect my son's opportunity to be seen by elite coaches? No. There are no team or club fees associated with becoming a U.S. Soccer Development Academy. However, players and coaches must be registered with U.S. Soccer. Registration fees for U-15/16 and U-17/18 players are $10 per player and $25 per coach; U-13/14 players are $100 per player and $50 per coach. Fees are subject to change. Yes. Clubs must field a team in both Academy age groups. Academy Teams are required to provide a minimum of 18 full-time players on their Academy Team Roster. There is no maximum limit on the number of players on the Team Roster as long as each player starts a minimum of 25% of the Academy team’s matches. Yes. Academy teams are encouraged to place players at their appropriate ability level. For example, the U-17/18 Academy Team should include a balanced mixture of 17 year olds, 16 year olds and a few exceptional 15 year olds. The Academy Season will begin in fall and end in July with the Academy Finals Week. Teams will break from the Academy Season during their local high school season and periods of inactivity due to weather. What is the format for Academy Competitions? Academy Competitions consist of Academy conference matches, Academy Showcases, Academy Playoffs and the Academy Finals. A team is expected to play between 30-38 matches per year between the four competitions. U.S. Soccer will assign Academy Clubs to a geographically-based divisions and conferences. The Academy Teams will play each team in their division home and away and will play a selection of their non-division conference opponents. Teams do not play more than one game per day and no more than three days in a row. All Academy teams are required to attend the two Academy Showcases, which will feature three games against non-conference opponents. Information on Academy Showcases can be found here. The leading teams in each division will be selected to play in the Academy Playoffs at the end of June. The top teams from the Playoffs will be invited to participate in the Academy Finals Week held in mid-July at the Home Depot Center in Carson, California. U.S. Soccer will pay each team’s travel and board expenses for the Academy Finals Week event. The Development Academy 2008-09 season includes a new postseason process introduced at the Academy Annual General Meeting in July 2008. Click here for an explanation of the new process. No. Each conference calendar will vary depending on climate and local high school calendars. Academy teams will play 15-20 away matches in a given season, some of which will require overnight travel. Exact travel distances will vary between teams depending on their geographic proximity to their conference opponents and Academy Events. Development Academy Clubs are responsible for all team travel expenses. U.S. Soccer will cover all travel expenses to the Academy Finals Week for Academy teams that qualify for the event. The home club will make facility arrangements for their Academy Conference matches. U.S. Soccer will make facility arrangements for Academy Showcases, Academy Playoffs and the Academy Finals. Academy Clubs are expected to secure the best possible playing environment for their Academy matches. Academy teams are not permitted to participate in competitions such as State Cup, Super Y-League and U.S. Club Soccer. Can Academy Matches be played in concert with a Club’s non-Academy Tournament? Academy games can be scheduled at Academy and non-Academy tournaments, but the games must not count toward the tournament standings. Can Academy Teams schedule ‘friendly’ matches during the Academy Season? Academy Teams can schedule ‘friendly’ matches during the Academy season to provide players with heightened development experiences. The matches must not be part of an organized competition, i.e. tournament, league or camp, as defined in the non-participation regulations. U.S. Soccer will assign officials to all Academy Matches. U.S. Soccer will cover all of the Referee fees for Academy matches. How will participating in the Academy affect my son’s opportunity to be seen by elite coaches? Academy competitions provide ideal opportunities for coaches to scout players in their natural environment. Over half of all Academy matches are observed by a member of the national team scouting network. Over 100 different players from Academy clubs were called into Youth National Teams in 2008. College and professional coaches have also utilized the Academy program as a scouting platform. After the first season of the Academy, over 800 Academy graduates moved on to play college soccer.